Spirograph has a long history as a toy – dating back to 1965. Its actually not the original – as the copy above says it was based off a drafting tool invented Denys Fisher. 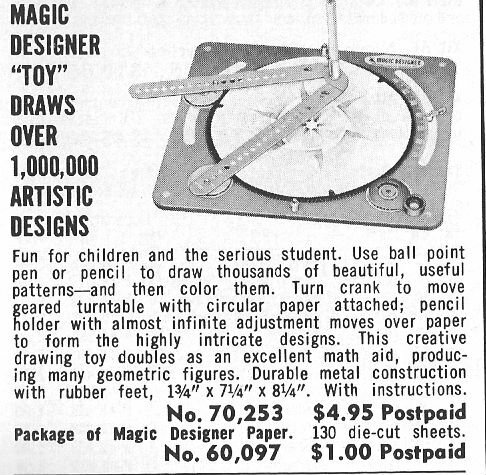 It probably looked something like this tool from 1968 (scanned from the Edmund Scientific 1968 catalog). Mechanical adjustable Pipettors area mainstay in most labs. They are excellent for ‘dialing in’ the exact amount of liquid that your system needs. 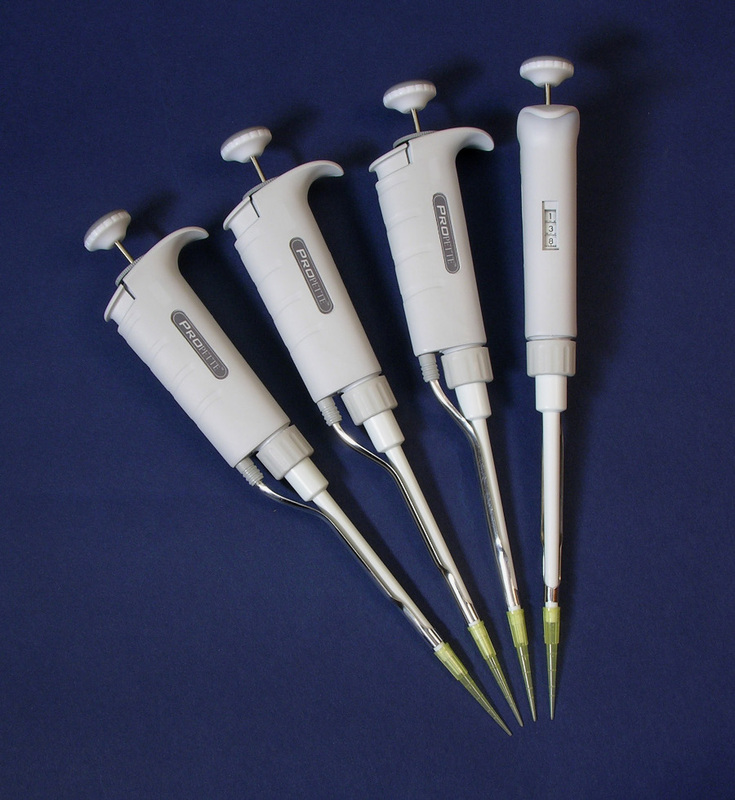 We’ve carried such pipettors before and while they are decent instruments they have lacked certain features. New Colorful Super Magnetic Thinking Putties! For years we have sold quite a bit of Crazy Aaron’s Thinking Putty: The ones that glow, the ones that change color in your hand, andthe putty that is clear as glass! So. homogenizers. Quite possibly the most violent of devices used in a laboratory. When you consider that the term ‘homogenize’ is a more scientific term for ‘beaten to a (literal) pulp’. This process is used for turning organic material (such as bone, wood, plants) in to a material that can be better examined. While we joke about homogenizers beating organic materials to a pulp, keep in mind that what a homogenizer does is actually destroy the cell walls of a material. This process is called lysis. It has many uses, far too many to go into here. OK, so we are continuing from Part 1 of this telescope assembly. Our base is pretty much together, but now we need to add the encoders. Here is where we shall see the major issues with the way Orion’s instructions are laid out. First of all, as we mentioned in the 2nd to last paragraph of part 1, you have to stop working from the main instruction manual. There isn’t really an indication as to where you should do this, but if you continue to build your telescope you will need to unbuild it to attach all the pieces needed for the Intelliscope parts to be attached. In order to continue properly, you actually have to switch over to the manual that comes with the Intelliscope controller. There was a time when there was good reason for why this manual was separate from the main manual. 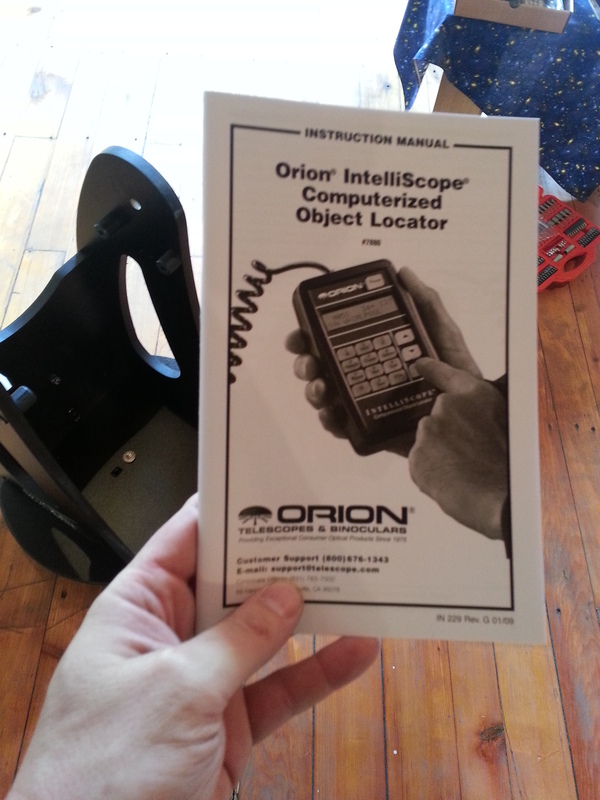 Orion originally sold the Intelliscope with and without the Intelliscope controller. Four years ago they ended that policy since the “Classic” SkyQuest was still available. Now all the Intellscopes come with the Intelliscope Controller, so there is no legitimate reason to confuse the customer with different manuals. Especially ones that have errata and parts for versions of the Intelliscope that have not been made in 7-8 years. A bit of a disclaimer here. This is going to be as much of ‘what’s wrong with the Intelliscope’s instructions as much as it will be a ‘how to’ for helping set-up your Intelliscope. First a little background: Dobsonian telescopes, with their large mirrors and lazy-susan bases have been around for ages but it wasn’t until Orion released their SkyQuest XT line in the late 90’s that they became popular. Previous Dobsonian telescope models had issues with balance and were trick to keep on target. Odd solutions like weights added to the outside of the telescope were clunky and awkward for basic users. Orion solved the issue by adding the CorrectTension system, which was a spring that held the optical tube of the Dobsonian to the base. It was a simple and elegant solution and it worked very well. 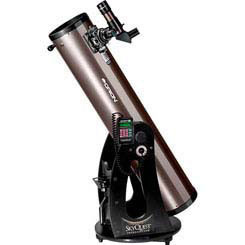 The line got excellent marks and was considered one of the best Dobsonian lines on the market . At first Orion just sold a 6″ and 8″ model, then added a 10″ model, a 4.5″ kid’s model, and later a 12″ model. For several years, Orion pretty much dominated the Dobsonian Market, but when imitators cropped up they decided to improve their classic Dobsonian by adding a computer guidance system (not a computer control system like many GoTo telescopes). Here you would get the advantages of having a computer system to help you find objects. It would not require batteries for any motors and the observer would be the person moving the telescope, using a hand controller to guide them. OK. there’s really not too much I can add to this video. It is Commander Chris Hadfield performing David Bowie’s Space Oddity. Mind you he is doing this while on the International Space Station. Some complained that this cover is the most expensive music video ever made since it was done on the ISS, however some point out this simply is not true.